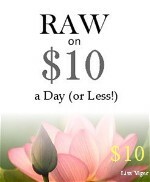 Raw on $10 a Day (or Less) eBook Giveaway! I'd like to do an ebook giveaway this week. Included in the ebook are some recipes, but also sections on creating your own original recipes, photographing food, growing wheat grass, etc. To enter, just leave me a comment here and let me know what you've found helpful or enjoyable about this blog. What have I found helpful? Everything. I love the recipes, the unique presentations, following through your day's worth of meals, reading the nutritional stats. I get excited every time you post. Thank you for sharing your ideas, inspirations and insights. I love this blog! Your ideas about dessert have been extremely helpful. I now eat "healthy" chocolate desserts almost every night. I have tried almost all your recipes. Your blog has helped me to create more balanced meals and I love that you include calories and other daily values at the end. That has helped me out a ton as well since I need to make sure I'm getting enough calories in a day. I now follow you on google friend connect. o.m.g. everything looks wonderful!!! love you! the squash blossoms made me smile...and brought me back to my childhood...my family use to batter these little guys up and fry them...i was in heaven anytime my mom made these...thanks for rawifying the recipe! i find that your blog so helpful...the recipes are always so mouthwatering and down to earth!! and i love reading the nutritional values...and your photography is just so beautiful!! i follow your blog on google friend!!! I absolutely love the recipes on your website. Great price, presentation, preparation, and pleasure:) Whenever I'm in a raw slump or don't feel like cooking, you're blog is the first reference I use. I just love how simple your recipes are!! I also like that you include the nutrition facts - I am not a calorie counter at all but I do like to have a clue about what I'm consuming! Thanks again! well... today I thought the chocolate tacos looked interesting! May have to try them! Your recipes and ideas have given me hope and motivation in this society we live in!! There are not a lot of people in my immediate circle of friends/associates who eat "healthy" like this. I am so motivated and excited when I see a new post. Thanks so much for sharing your information and creativity!! It is so inspiring :)!!! I am following through google. 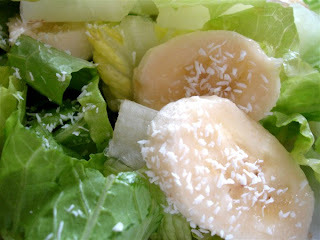 I've been on a raw diet for a while now and I haven't found anything near as helpful as this blog! The recipes are so easy and cheap I feel like I could continue on the diet forever! I'm also learning a lot about different types of plants, what's edible and what isn't, and the different seasonings that make food taste great! 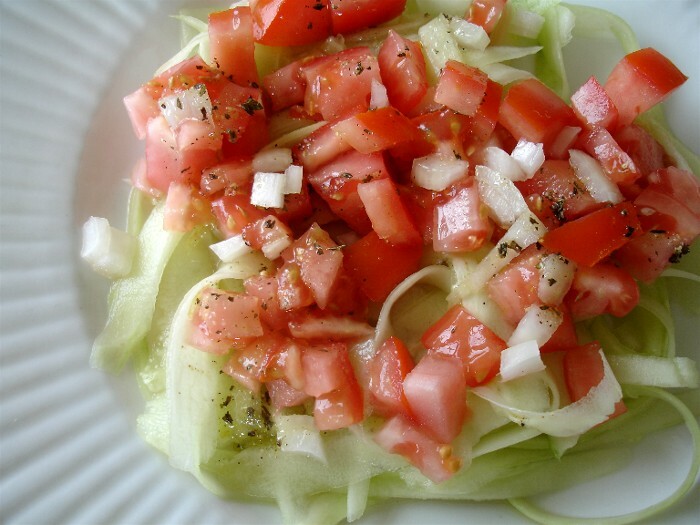 I really enjoy how you make raw recipes so doable! We have been dabbling in raw and some recipes I find just seem to take so much effort and preparation. You break it down, make great meals that are simple, and you even give us pretty pictures to pique our senses! I get excited to see your new posts pop up every week on my RSS reader. I have started following your Vegan blog, too! I have recently gone 100% raw and being a college student that didn't seem like a bank friendly task...that is until I found your blog! Your blog has helped me eat balanced meals and fulfill my calorie needs without going broke. I have never felt healthier! thank-you for that! Fun giveaway! I've liked your blog from the start, everthing about it. One thing in particular is how you seem to march to the beat of your own drummer. Some of the recipes are so original, outside the box, and something I have not seen anyone else consider doing in raw world. I love that! Yet those recipes are not intimidating or scary -- they always seem do-able, beautiful and affordable! Brilliant. I just tweeted about you via RawShopper (my Twitter account). Squash Blossoms! Who knew? This is totally news to me. LOVE it. Boy, oh boy, do I have cukes. My garden overfloweth. Keep those recipes coming. 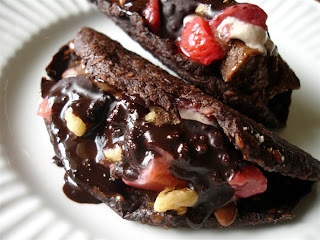 Chocolate Tacos...does it get any better than this? WOW. I started out my year trying to do one full raw day a week a shot. and I was using your recipe as my go to for the perfect meal planner! I am sad to say, I wasn't able to stick with it. I don't know if it was the cooler months or family demands that made it hard. also I have still yet to get my hands on a dehydrator. but I am still here, and now that it is warmer, I am hankering for more of your beautiful raw creations. Husband is cleaning up his diet too, so this helped me a LOT. I would love to win one of your uncook books! I just was gifted with a huge zucchini so I have saved your mushroom alfredo recipe! perfect! What I enjoy the most is the lovely photographs. They make me want to try the recipes they look so good! your posts are great, esp. for those who say eating healthy is too expensive! thank you so much for all the time you put into lovely photos and caloric specifics. we all benefit so much from the work that you do. we'd love any e-book you've made! we're a family with 4 boys and the youngest and i are celiacs. health is what draws me to raw foodism. Wow, I would really want to win this! This entire blog has proven me wrong about the raw vegan diet having to be at least 5 times more expensive than the cooked, omnivorous, junk food diet. The caloric and macronutrient profile of each dish you feature in your blog lets people know that is possible to be sufficiently nourished on a RVD for $10 (or less!). The elegant presentation (plating and photography) of the dishes makes each meal look so gourmet. 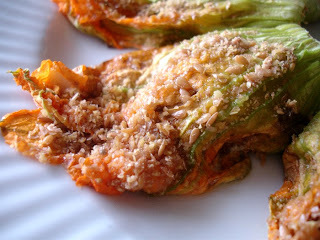 I have to remind myself that they're actually budget-friendly and quite easy to make! I have been raw for more than 4 years now and I still don't know how to make the RVD affordable, yummy, and nutritionally balanced all at the same time. I've always thought that compromises are inevitable, i.e. 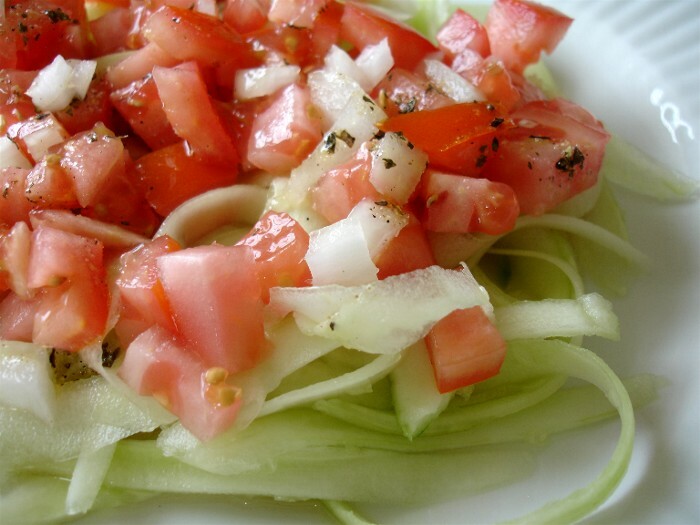 if you're on a raw shoestring budget your meals would either be lacking in nutrients or would have a sorry taste, or both. That's why I wanna win your book. I need to learn new recipes to get me more into this groove (your blog is already doing a good job BTW) and to learn how to create my own unique, professional-looking, cheap yet deliciously nourishing RV recipes. Thank you very much for this wonderful giveaway! You've helped me understand how simple raw food can be. It's aided me in a simple & energy induced thought pattern which I highly appreciate. This lbog has been helpful in giving me more ideas going towards being more raw. I love the menu planning and it helps have a consistent healty plan. Thanks for the giveaway! I already follow you on your blog on Google Connect! You are full of such wonderful ideas. Love it. Things like salad for breakfast..makes perfect sense, but I wouldn't have thought of it on my own. =) Love your blog! I came across your blog a week ago and I enjoy each entry! I have been vegan for 3 years and I do love raw food! Your recipe's have given me a massive amount of inspiration! Thank you! I would love to read your ebook! I also blogged about it and your give away! I forgot how much I loved your recipes! ebook or no, I LOVE your blog! I eat bananas, walnuts, and soya milk as a staple breakfast (cant seem to find unsweetened coconut flakes in the UK or any coconut really!). It is soooo delicious! Perfect after my morning workout, like a real-fruit cereal. Hi :-) Discovering your blog has blown my away!!! It has opened me to all manner of new (and not difficult) possibilities in regards to raw/vegan nourishment and pleasure! Your creations are divine! And the photos extraordinary! 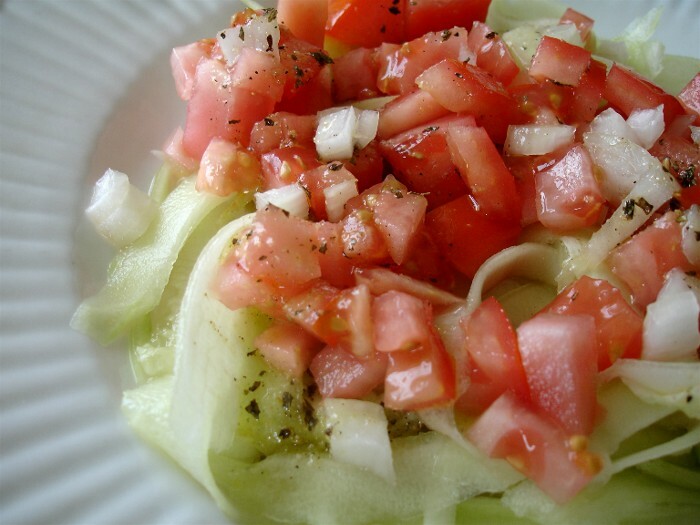 I love your quick and simple recipes that still are so elegant and delicious. I love the simplistic beauty of the dishes. So many raw recipes require so much preparation ahead of time, it sometimes seems too "processed". 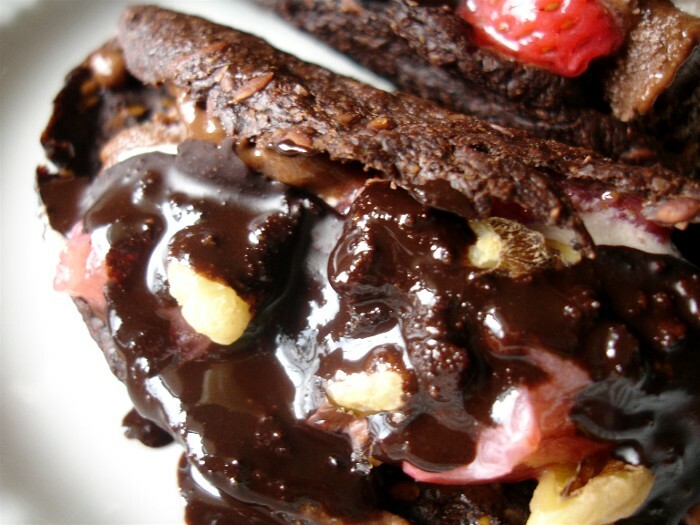 Your blog has made raw foods so quick and easy, and the nutrition facts are great too! I have yet to be dissapointed with any dish from your blog. Big Mahalos to you! 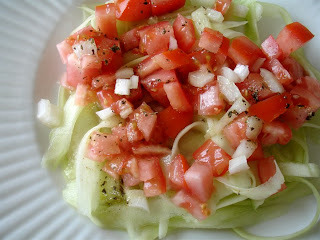 Every time I read your blog I am reminded that eating raw food can be simple. 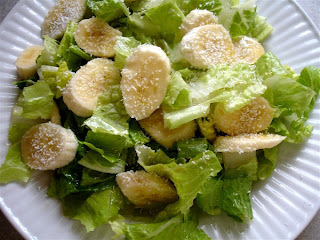 The simplicity of the banana salad makes me smile and feel inspired. Thanks. I love your blog so much I shared it with my friends. You have such yummy recipes. I like the pics w/ the recipes to get an idea of how it's suppose to look. I love the price of the recipes and the variety. I posted on my facebook page! Please enter me for the giveaway. Wow, those tacos! An indulgence, to be sure, but I bet they're spectacular. From your blog, I've discovered lots of useful tips and techniques for raw food prep, and of course recipes galore. as do those choc tacos!! your food inspires me..that's what i love about your blog! I find everything on your blog helpful. I enjoy eating good food on the cheap whenever possible! ps my mom loves ur banana ice cream too! 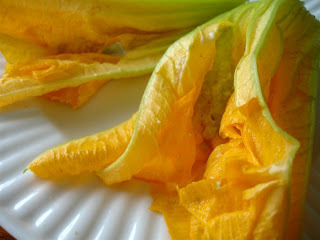 As a new raw food fan, I love how your blog opens my eyes to new food possibilities, not thought of before. Thank you! WOW! I only just discovered your blog yesterday and it has VERY quickly become my new favourite thing. During the past few months I've been trying to incorporate more raw foods into my already vegan lifestyle; Your blog has provided me with inspiration of Godzilla-like proportions! 1/ I love the prices you put with the recipes. I always shop on a budget so this is of great help. 2/ The calorie count is useful! While I don't rigidly count calories in everything I eat, it's good to know roughly what to expect out of each meal, especially since I'm trying to lose a bit of weight at the moment. 3/ Your chocaholicism has totally won my heart. Every recipe involving cacao powder makes me swoon!! Fabulous! What a great blog. It's nice to have the photos, the cost breakdown and straightforward preparation methods. A great inspiration! 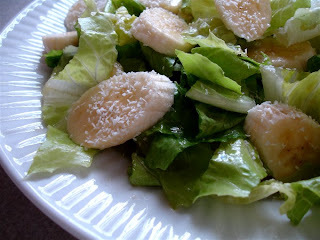 I love the salad type ideas, they are things I never think of. The desserts are so creative as well! I am a vegan, but am trying to incorporate more raw food into my diet. I love that your recipes are delicious, yet simple. I am on a strict budget, and it's inspiring that I can recreate these meals without having to purchase expensive ingredients. Those tacos look incredible! I actually just bought your ebook so I don't need to be entered. Am I supposed to get an email with a way to download it? Your blog really has been a wild and crazy inspiration to me. Of course i'd love a copy of your book, but a greater treat to me would be knowing that you deeply understand the positive change you've made in peoples' lives! I've always wanted to see what a raw foodie eats in a day. I've wanted to know how one can enjoy fresh food for every meal, yet still have time to go work full time, or raise kids, or build an ark, or what have you. Today, I had a wonderful, satisfying 100% raw breakfast, and it's all thanks thanks to you. Delicious, simple, afforable, accessable! Thank you so much. 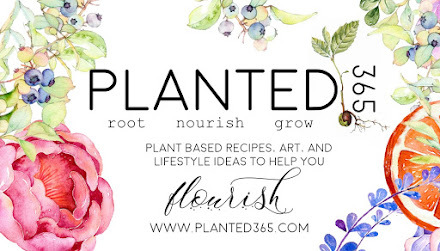 As someone brand new to raw veganism, I've found that your site stands out because it doesn't rely nearly as heavily on specialty equipment. I initially bought a raw recipe book intending to use that to try eating raw but quickly realised that I don't have a Vitamix, a dehydrator, a spiralizer or days in advance to plan my meals. Oops! I came across your blog and it was just what I needed. 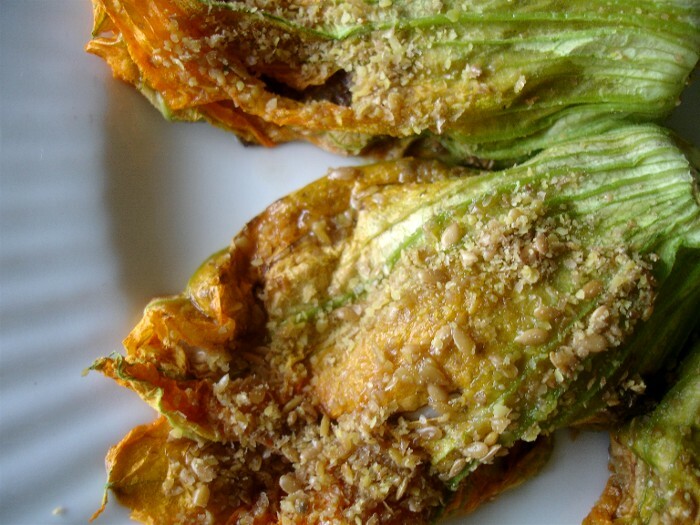 Simple, inexpensive recipes, most of them possible without expensive gadgets. Hooray! I've since passed the link on to several raw-curious friends who have been thankful for the same. Hello, I just wanted to say I love your work here. I think its great that you are showing that raw can be fast and inexpensive! I would love your book. thank you for everything you post! You always seem to post about the exact thing I am crazing. Seriously, I just happened to dehydrate flax banana shells last night and have been trying to decide what to put in them. 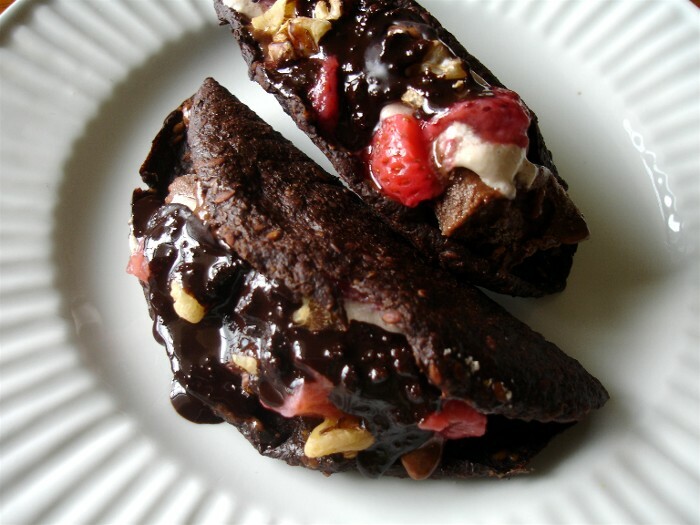 Chocolate tacos sound perfect! 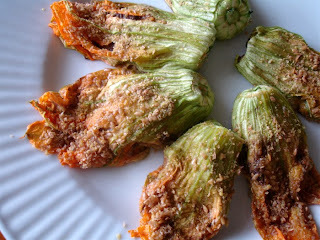 AND I have been wondering if there was a raw alternative to ricotta filled squash blossoms. Your recipes are amazing! Your beautiful menu illustrations give this blog such visual appeal, along with the excellent photographs. The food is delicious and inspiring, and CHEAP! I love that raw doesn't have to cost loads! Whenever I need to re-inspire myself, I go over your archives. My fave breakfast has become melon and strawbs sprinkled with coconut. So simple and yummy! Love, love, love this unique blog. Note to self: Don't look at pretty food blogs when you're hungry but already brushed your teeth! Your blog has been an inspiration to me. Everyone I know is always asking me about my new raw kick and how I afford it. I quickly send them to you! Every week I look fwd to the new recipes and aspire to do something like it one day.